The host disorganized Real through the half-space combination, created space between the lines, and dominated the match against the free-flowing and direct-offense, Real Madrid, but forced to end it with a draw, after Sergio Ramos equalized in the injury-time. From the early minutes of the match, Real had indicated some of their typical defensive weakness. Zinedine Zidane applied a medium-block since they opted to invite Barcelona to come out searching for the chance to play the counter attack. Los Galacticos’ troops practiced some uncoordinated man-oriented press which opened up some strategic space. Real’s medium-block was established based on the 4-5-1 basic shape. Luka Modric, Isco, and Mateo Kovacic in the central area flanked by Cristiano Ronaldo/Karim Benzema and Vasquez who dropped to the flanks. The first-line of press oriented to Barca’s six space. The advanced-winger oriented to the opposite’s full-back. Isco to go against Gomes, Kovacic to go against Rakitic, and Modric secured the space between the middle and back-line. To disorganize Real’s man-oriented and open up space, Barcelona used some different schemes. The first one, they overloaded the ball-side half-space and dropping off the near-8 (Andre Gomes) to the six space. By moving Gomes far to the deep Barca hoped that they dragged the opposite-player, Isco, to come out. As Isco moved out to press the Portuguese, the space behind Real’s middle-press automatically opened up. The problem was the same. There was no adequate coordination. No orderly chain reaction in Real’s collective shift that gives the players the proper guidance of how to establish the mechanism of defensive-movement, of how to maintain or develop access within the block. Lack of coordination equals with bad access and bad spatical compactness. Mascherano held up the ball, waiting for Isco to come out before exchanging passes with Andre Gomes and played it forward to Busquets. From Busquets the ball was played to the vacated half-space since Isco’s premature onward-press wasn’t followed by adequate coordination of press. Notice Vasquez whose press (to Alba) opened up horizontal-gap instead. Good for Real, as in this situation, after Busquets played it to Neymar, Real managed to stop Barca’s progression. Thanks to Daniel Carvajal press on Neymar that stopped the Brazilian from turning around. 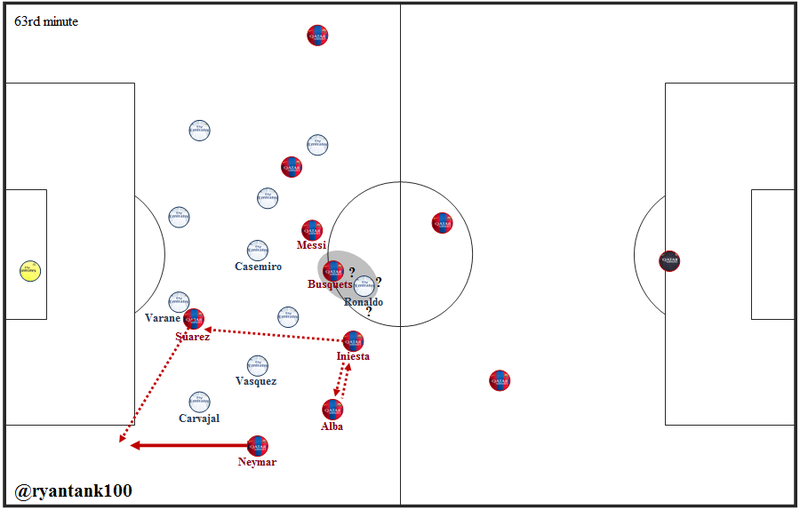 Within their build-up, particularly in the middle-third, Barca have used the same scheme constantly. Another example of the similar pattern was from the 6th minute. Busquets with ball on his feet, in his own middle-third. From the opponent’s middle-third, Gomes dropped to the Barcelona’s middle-third tried to drag the opponent’s nearest player out of his position. Busquets played diagonal pass to the half-space to the feet of Neymar which enabled Barcelona to progres to the deeper area of Real’s defence. At times, the near #8 didn’t drop deep, but he chose to occupy the space behind the opposite’s midde-press, overloaded the vertical-area along with two of three Barcelona’s forwards. 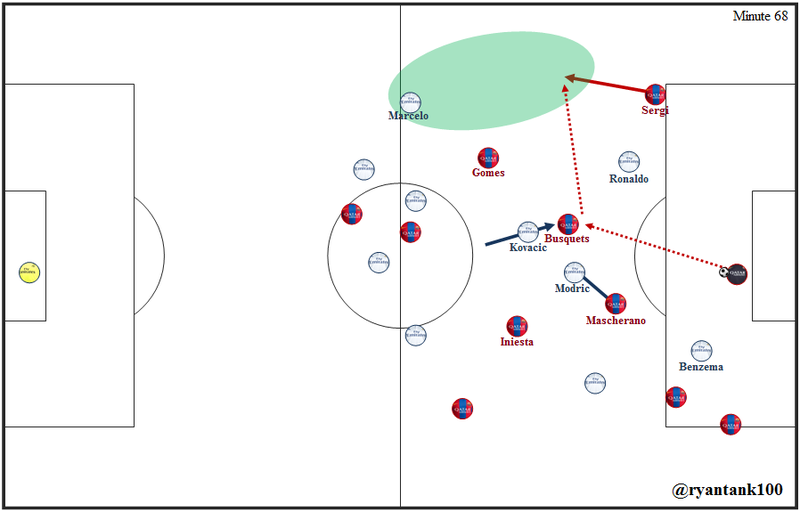 The pressure-resistance of the players and the ability of playing in the tight space had enabled El Barca to establish a quick passing combination and penetrate into the 18-yard box. For instance, a moment form the 9th minute. In the build-up from the back, Barcelona created a 3-at-back-shape with Busquets dropped deep to overload the first-line since Real Madrid pressed them with high-line. 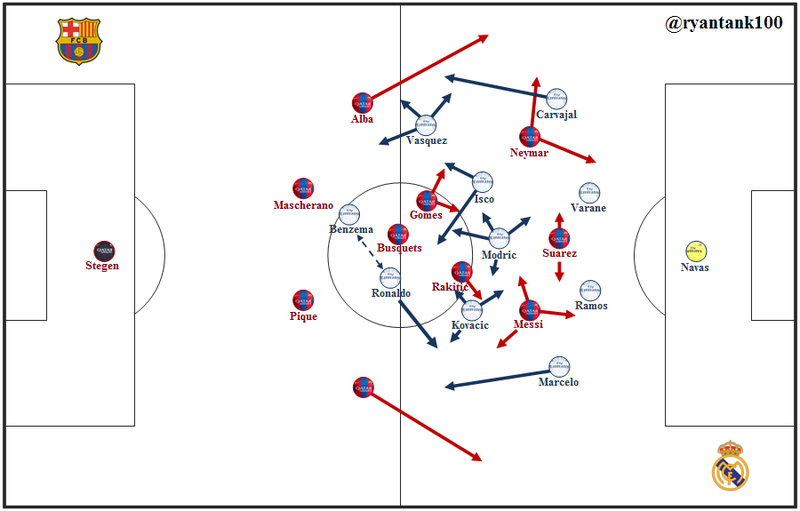 As the central defender moved wide, Barcelona’s full-backs were pushed higher up the pitch. In respond to this structure, Real pressed using a three-forward-press. Isco moved up to go against Busquets supported the Ronaldo-Benzema duo whose press oriented to both Barca’s central-defender. This pressing structure transposed Real’s shape into a 4-3-3/4-3-1-2 one. With three midfielders left in the middle-line, Real lost some pressing intensity on the wide area, let alone the three midfiedlers would have to be focusing centrally. This, in turn, allowed the chance for Stegen to bypass Real’s first-line press by playing a diagonal floated balls to the near/available full-back. But, the key was not only the full-back factor. To support such pass by Stegen, Barca needed to attract the attention of Real’s middle-line in order to create space for the full-back. That’s the requirement. Again, the presence of the #8 was the key here. Gomes dropping-deep movement close to Busquets attracted the attention of real’s near midfielder. If this Real’s midfielder didn’t follow Gomes, Barca would overload the first-line and progressed-easily. But, if he did it, the wide-space would be opened up and generate good chance for Stegen to play it wide, to the full-back. Barca made use of such chance in couple of times. But, on the other hand, this didn’t mean that by playig to the full backs, Barca would easily progres to the final third. The positive-side by playing it to the full-backs, was the ball had reached the higher-zone. So, when Real’s middle-line players were able to shift and block the access to their defensive-area, at least, Barcelona had had the ball in the zones closer to the Real’s half. And when the progression access was completely blocked, the attack restarted. Busquets whose role was to connect the circulation both vertically and horizontally would move wide and get close to the ball-side. From the full-back, Busquets received the pass and simply played it shortly to the nearest or savest option. Sometimes, Real seemed to aware of such pattern. They shifted-properly and established a good-coordination of press. for example, when Marcelo move far forward to press Sergi Roberto, Modric covered the near half-space by keeping an eye on Barca’s near #8. On the wide area, Sergio Ramos covered the vacated-space and kept Messi under control. Had the ball played to Messi, Ramos had been occupying the right zone in order to intercept the pass. The swap between Messi and Suarez was also the factor of how Barca diconnected Real’s press. Especially in a high-block press, when Stegen was forced to play it long. At times, the ball landed t the intermediate area and Suarez was the one who dropped to pick it up. Since Messi stayed in the opponent’s back-line, Real’s last-line seemed to be reluctant to move out and press Suarez. El Real’s offensive approach was much simpler than Barca’s. From the back-line, if possible, they would be more than happy to directly play it to the frontest-line. But, by choosing this way of play, one of the effect was clear, it would possibly weaken the counterpress on their defensive-transition, should the opponent’s back-line managed to stop it. How come? When an attacking-team display such direct-approach, the spacing is sometimes found to be weak since the distance among the passer, receiver, and players in-between was distance too far. Especially in the team that doesn’t ready for second-ball battle. Weak spacing means weak connection/access and weak (pressing)-access means unstable gegenpressing. Real insisted to apply this scheme since it was purposely to create as much as qualitative-superiorities up front. The focus of the attack was creating access through the wide-area. And, in many times, Barcelona managed to block the access (if you remember or ever heard about “touchline is the best defender) and eliminated the vertical access. In such situation, Real’s players would switch it from one flank to the other one. From which they tried to generate another superiorities, within the underloaded-side. 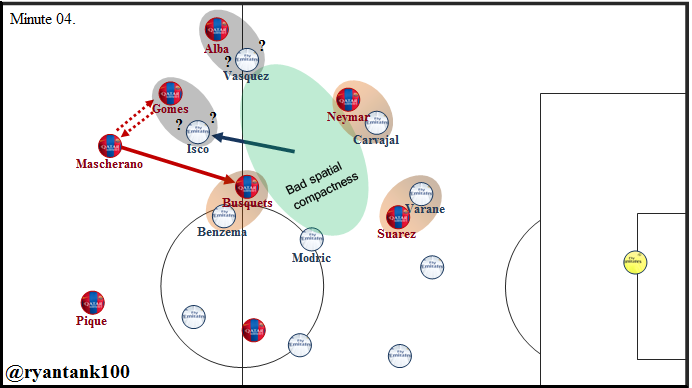 Barca’s high-press combined with Real’s weak build-up had also been the factor of why the guest opted to play this pattern. It had been hard to beat the host’s press. And when they did get the chances to do so, those were mainly because of the individual-excellence. Luka Modric was the man. He dribbled through the tight-space, he moved across the middle-line to find the free-player between the lines, he tackled, intercepted, and fought for the ball. Modric’s main area were around the six and eight. On the upper-ground, Isco was the #10 in Real’s offensive scheme. His task was simply as bringing the ball forward to the final-third. Since Real’s attack was a wing-orientation one, the progression scheme was clear. Isco played it to the wide to seek the chance of generating qualitative-superiority or crossing into the box. In the second-half, as the need of chasing the equalizer increased, Real not only need to push further forward but they also had to make sure there was no any single chance for the host to circulate-cleanly. Through the high-press block, Real seek the access to press the six-space and if needed they continued the press to the goalkeeper. Thanks to the spacing that connected the center and the wide area which enabled the host to surpass Real’s press. And, also, yes, Sergio Busquets was there. He didn’t only took the right positioning since he had to be the connector, but his pressure-resistance had been the ultimate factor of how he could think and react so fast. Errr, I know, this is something Busquets has been well-known for. Realized that Modric was engaged to Mascherano, Busquets positioned properly, to the next of Modric, as it provided a good passing option for Stegen. Notice on Kovacic. The Croatian made an intense run to press Busquets from the back. But, the Catalan seemed to be realized it too (not sure on this) as he switched the ball so quick to the wide to the on-rushing Sergi. This pass had created a 2v1 situation in favor to Barcelona (gomes and Sergi vs Marcelo). The continuous moves by Messi, Neymar, and Suarez had made it hard ofr Real’s midfielder to cope with. In context to stop them creating valuable opportunities was nearly-impossible. Neymar moved from one half-space to the other one. The Brazilian moved closer to Messi to play some combination with Messi who often took slightly deeper zone to Neymar which managed tocreate some penetration-access for the host. Such positioning and their individual-skill enabled a lot of short combination followed by a through pass which cut through Real’s low-block. The subs of Isco for Casemiro was intentionally to provide more protection to the space between the lines. But, the fact that Barcelona continuously moved their players within the final-third had made it hard for Casemiro and co. to determine where they should be staying and how they had to move or do. But, it was not only the Busquets-factor and Barcelona’s excellence positional-structure that enabled them to circulate comfortably. Again, it was the lack of pressing-coordination within Real’s block. For instance, the lack of backward-press of 63rd minute by Ronaldo. Real’s lack of backward-press took huge part on allowing Barcelona to perform their possession-based football. Lack of backward-press. The moment after Busquets’ brilliant turn. Iniesta and Alba exchanged pass as it might dragged Vazquez slightly wider as well as widened the horizontal gap for Iniesta to pass through Suarez. Someone, please tell CR7 it was not mannequin-challenge. As they needed to push further forward, Real used the central defender to get involved in the switch-play. Ramos and Raphael Varane positioned higher into the opponent’s middle-third and made some diagonal balls to the far flank. The positionigs of the two had also pushed all Real’s midfielders and forwards to occupy higher area and pinned Barca’s defense to the deep.making it easier for Real’s wide-men to receive the switch-ball. Zidane decision to take Mariano into the field resulted some positive impact. In two of his pressing-action, Mariano managed Real to regain possession by forcing El Barca to give up two throw-ins. Real’s wing-oriented, which widely-critized, as it was a highly one-dimensional play, finally provided maximum effect for them. Some crosses resulted dangerous situation for the host which one of them, in the 90th minute gave them the equalizer. This entry was posted in tactic and tagged Barcelona, El clasico, Enrique, La Liga, Real Madrid, Tactical analysis, Zidane. Bookmark the permalink.